A new Brazilian place in Coeur d'Alene. Plus, Thai Bamboo goes Vegas. 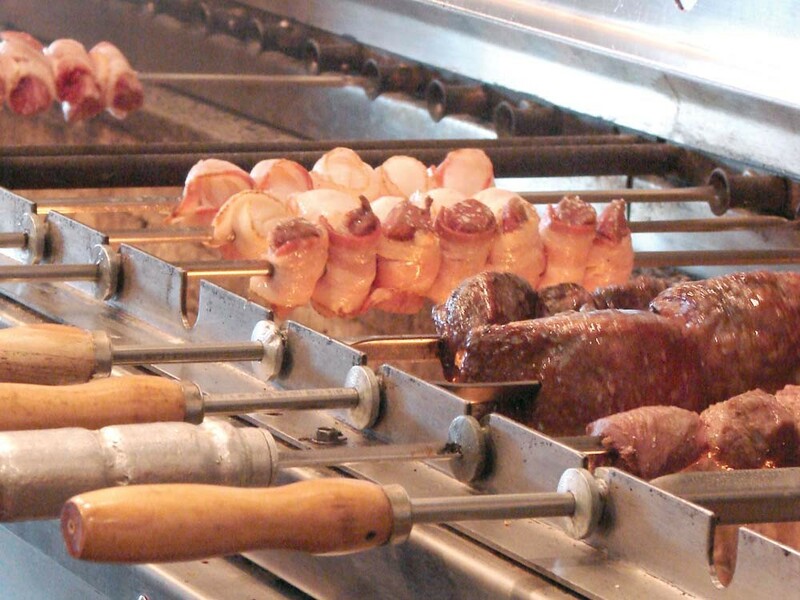 Lean and tan and juicy and lovely, the meat at Coeur d’Alene’s new Brazilian steakhouse, Grille from Ipanema, will make you say, “Ahhh.” According to owners Adriano de Souza and Fabricio Soares, who met in college, the menu is typical of southern Brazilian cooking. Soares’ background includes 10 years working for the Tucanos Brazilian Grill chain, while de Souza worked at Bonsai Bistro before opening Grille in downtown Coeur d’Alene’s chi-chi Parkside Tower location. The hot-and-cold fiesta bar ($13 lunch/$17) features tropical fruit and salads — like one with palm hearts, sundried tomatoes and mozzarella; or a cabbage slaw with green raisins and mango. Warm dishes range from gnocchi to collard greens to rice and black beans. The full “churrasco” experience (lunch is $15 for adults, $8 for kids; dinner is $25 for adults, $12 kids) includes the fiesta bar and refers to the openflame cooking originated by Brazilian cowboys. Here, roving servers tell you the name of the dish in Portuguese, then in English, before slicing any of 15 standard mesquite-grilled meats or vegetables onto your plate. Garlic steak and top sirloin are popular beef options, as are pork, poultry and specialty items like pineapple or fish in mango sauce. When you’re full on the experience — or need a digestive respite — flip over your “Yes, Please/ No, Thank You” coaster and order a specialty drink to settle your stomach. Try lemonades made with condensed milk, sugar and fresh strawberry, mango, raspberry or limes ($4). Adult beverages like Brazilian Sun Rise ($6.50) feature sparkling wine, while beer is available on tap or by the bottle and includes Xingu (pronounced shin-goo), a black beer named after the Amazon’s Xingu River. Two blocks north of a previous location on Division Street, Thai Bamboo opened its fourth outlet on Tuesday, May 10. The new 9,500-square-foot restaurant has seating for over 200 people, two outdoor patios, a private banquet room and a lounge. The move to a bigger location with flashy décor coincides with Thai Bamboo’s ten-year anniversary. “With little new building going on because of the economic slump, a new Spokane landmark with a big, bright, fun-looking outside should cheer people up,” says owner Tom Burgess. The restaurant’s interior is filled with gold- and jewel-toned statues, sequined dragon wall hangings and chandeliers with tropical birds. In the main dining area, the sky-blue ceiling is equipped with thousands of lights, fiber optic stars and lasers. After the restaurant closes in the evening, the pocket doors to the lounge slide open to create a nightclub with music and a light show that gives the illusion of dancing under the stars. “Not bad for Spokane,” Burgess says. The menu includes Thai favorites like Swimming Rama, curries and salads, as well as a few dishes with Japanese and Chinese influences. The pad Thai noodles served with my lunch combo could have used a little more flavor, but the Thai Super Bowl was perfect, with lots of sautéed veggies and chunks of lightly smoky organic Small Planet tofu. For $9, you won’t leave hungry. The Coconut Lounge Bistro, adjacent to the main dining room, features a pub-style menu of fish and chips, Thai hot wings, salads and snacks ($3-$12). Order a spicy cilantro martini or a pineapple mint mojito surrounded by faux palm trees and plan your tropical escape.